Is the Tide Turning Against Nuclear? 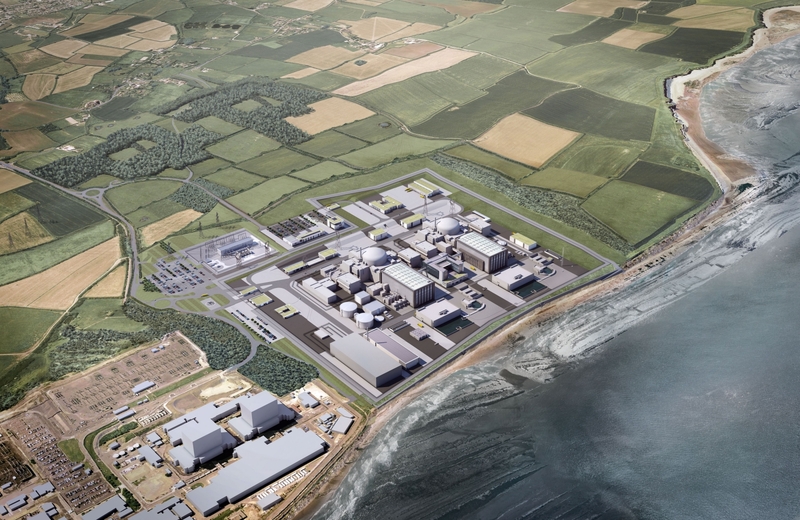 Hinkley C was supposed to be the flagship of a British Nuclear Renaissance. Originally the Conservatives were saying that it would be built without state aid. Nothing could be further from the truth. At a strike price of £92 / MWh UK tax payers will be subsidizing EDF, the French State owned nuclear company, and their Saudi investors, for decades to come. EDF are currently massively over budget and years behind schedule on their similar projects at Flamanville in France and Olkiluoto in Finland. This is very expensive, high risk and inflexible technology. Meanwhile Owen Paterson thinks the UK should invest in lots of small modular nuclear reactors powering district heating systems in all our major cities. I agree with him that a massive investment in district heating is a good idea; however his advocacy for small modular reactors seems poorly considered. Such modular reactors are used to power submarines, but not used anywhere for supplying either heat or electricity for several good reasons. It is hard to imagine the public accepting such high risk sites located in the heart of all our major cities, and the security implications of potential acts of terrorism would be insurmountable. My studies of the transition to 100% renewable electricity in Germany, Denmark, Uruguay and a host of other countries, is showing me that this is becoming a more and more realist, achievable and affordable policy objective. I have blogged extensively about the falling costs and other benefits of renewables. Professor Sir David King, the former Government Chief Scientist and long-time pro nuclear advocate seems to be having a change of heart. He recently argued that renewables plus energy storage technologies were a cheaper and better course than nuclear. George Monbiot, Mark Lynas and Stewart Brand are three of my favourite Green writers and all have come out in favour of nuclear power, yet given the continuing falling price and improving technological options of renewables and the difficulties and expense of nuclear I wonder how long it will be before they follow Sir David King and argue that renewables really are a better route to a low carbon future. I am, as ever, happy to debate these issues in front of any audience: there really is some good news that needs to be talked about. This entry was posted in Energy, Environmental on 26 November 2014 by Richard. Today, Thursday 20th November, the House of Commons is having a debate titled ‘Money Creation and Society.’ This is long overdue: the last time such a debate was held was in 1844. The interesting Conservative rebel backbencher Steve Baker proposed the debate, with cross party support from Caroline Lucas (Green) Michael Meacher (Lab) and Douglas Carswell (UKIP). It will be an opportunity to discuss taking the power to create money as debt away from commercial banks, which is what the Positive Money organisation has been demanding for some years. The headlines this week are of David Cameron saying the world is on the verge of another financial crisis. George Monbiot yesterday posted an excellent blog on the inevitability of another crisis and the damage that is being done to society and the planet by humanity’s headlong pursuit of growth at all costs. My recommendations would be to follow the Positive Money line and take the power to create money as debt away from commercial banks. My take on growth is that we need to abandon it as a policy objective. We need to prioritize other goals: ecological survival, social justice, human wellbeing. Then we need to plan policy that will promote these goals. That will mean the growth of some areas of the economy and the contraction of other areas: whether this results in overall growth or contraction is of secondary importance. I find Stephen Harding’s distinction between suicidal growth and intelligent growth to be more useful than the growth/ no growth debate. Humanity needs to leave 80% of known fossil fuel reserves in the ground to avert climate catastrophe. Managed contraction of the carbon generating industries must become a policy goal, and that is impossible given the political consensus to blindly follow headlong growth at all costs. Our survival may depend on changing the economic model, and I welcome today’s debate as a way to begin that necessary change of direction. This entry was posted in Economics, Politics on 20 November 2014 by Richard. For decades we’ve been used to debate about whether Britain is a two party or a three party political system: perhaps now we need to think of it as a 6 or 7 party system. Party membership for the three main parties is falling steeply: their combined membership was 3.8% of the UK electorate in 1983, now it is less than 1%. The Scottish Referendum was very good for politics. It was peaceful yet passionate, and it really engaged the population in political debate. On the back of it in just a few days the Scottish National Party membership went up by 70% and the Scottish Green Party by 300%. The Guardian predicts that the SNP may have the third largest number of Westminster MP’s after the General Election in May. Membership of the Green Party of England and Wales has risen 77% over the last nine months and is now at 24,435 and still surging upward. 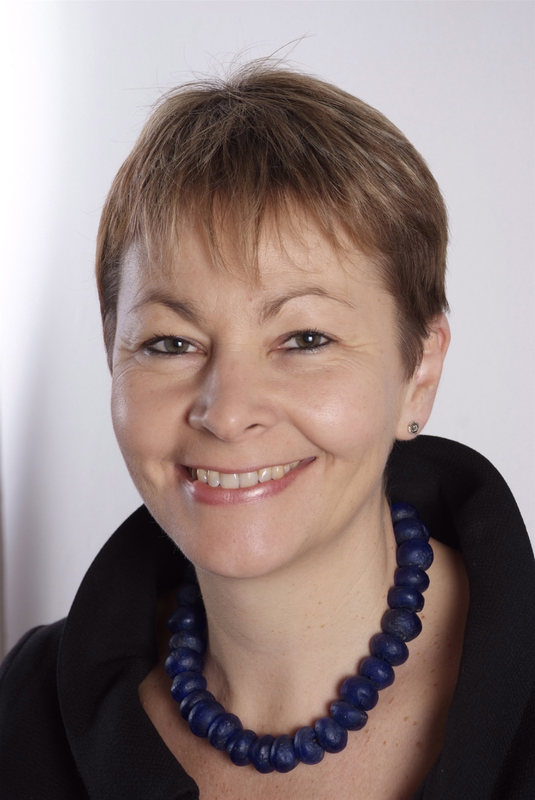 I certainly hope that the wonderful Caroline Lucas will be joined by more Green MP’s in the House of Commons in six months time! The popular mood is of anger and contempt for politicians, especially members of the three main parties. Across Europe the establishment centre is collapsing, which is both dangerous and an opportunity. Dangerous in that the populist and simplistic right wing parties are on the rise and as ever looking for scapegoats, and fear and insecurity are driving many into their camp. A time of opportunity in that Green and new-left of centre parties are capitalising by offering a positive, creative and constructive vision of a more socially egalitarian and ecologically sustainable future. Currently the UK Labour party has 190,000 members, the Conservatives 134,000, the SNP 80,000 (as of 10th Oct, and still surging upwards) Lib Dems 44,000, UKIP 35,000 and the Greens 32,000 (adding approx 24.500 Eng & Wales party with approx 7.500 Scottish Green Party) and Plaid Cymru about 8,000. The BBC still wants to screen a TV debate between the leaders of the old three parties, plus UKIP. However thirteen parliamentarians have written an open letter and a quarter of a million people have signed a petition calling on the BBC to invite the leaders of the Greens, SNP and Plaid Cymru. Including them would better reflect contemporary, ‘devo-max’, British politics! A real seven party contest! This entry was posted in Politics on 11 November 2014 by Richard. The Energiewende: Success or Failure? Has the German Energiewende been a success or failure? It’s a mixed picture. The above graph shows that Germany has made a remarkable achievement ramping up renewable electricity production from 46 TWh/year in 2003 to 152 TWh/year in 2013, more than trebling production over the decade. The historical context of the Energiewende was that nuclear power was seen as the greatest threat: if one was now starting the process reducing coal consumption and carbon emissions would have been a higher priority, but always reducing both was considered important. Over the decade nuclear has been cut by 67.8 TWh/year, and hard coal by 22.5 TWh/year. 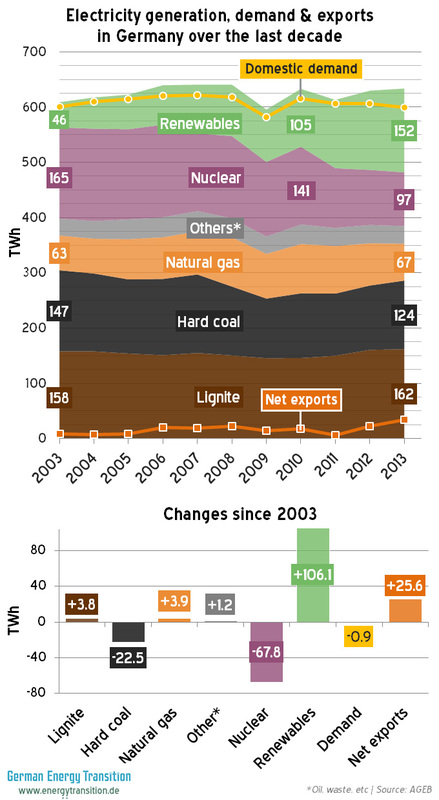 Lignite (soft brown coal) and gas usage both increased slightly over the decade, by 3.8 and 3.9 TWh/year respectively. Net electricity exports rose considerably, by 25.6 TWh/year. The one main failing of the Energiewende has been the inability to drive down overall energy consumption. The above graph shows a miniscule decline of 0.9 TWh/year over the decade for electricity. This is very much less than planned. Over the same decade oil use fell from 2,648,000 to 2,382,000 barrels per day: approximately a 10% fall. Huge achievements are being made reducing the energy consumption of many individual buildings and technologies. However at the same time new sources of energy wastage are being unintentionally incorporated into the system. For example more and more gadgets are being built with standby functions, and these energy vampires now use more electricity than all the trains and trams in Germany, for absolutely no benefit. Tax breaks for gas guzzling company cars are still allowed. Although new buildings and the best of the renovated older buildings are excellent, the rate of retrofitting the established building stock needs to ramped up from 1% to 3% per year. Driving down overall energy consumption will be the key to fulfilling the promise of the Energiewende. This will probably mean outright bans on some of the worst forms of wastage, probably some new taxes, increased investment in building retrofitting. Investment in renewable energy generation, strengthening the grid and developing a large number of energy storage technologies will also be important, but the success of the energy transition will probably hang more on reducing demand than on any other single factor. Overall much has been achieved, and humanity owes Germany a debt of gratitude for pioneering the transition to renewables. Germany has better political will to make this happen than most countries, and a much more difficult challenge due to its high concentration of people and industry and its relatively poor renewable energy resources. This entry was posted in Climate Change, Energy, Environmental, Global on 6 November 2014 by Richard.